Sorry, I'm not sorry. Allow me to go out on a limb here, guys. I try to keep this blog pretty practical, mostly nutritious, and classic. Or I at least like to have a good excuse to be completely ridiculous (see here for an example of my reasonable insanity). Every once in a while an idea gets stuck. 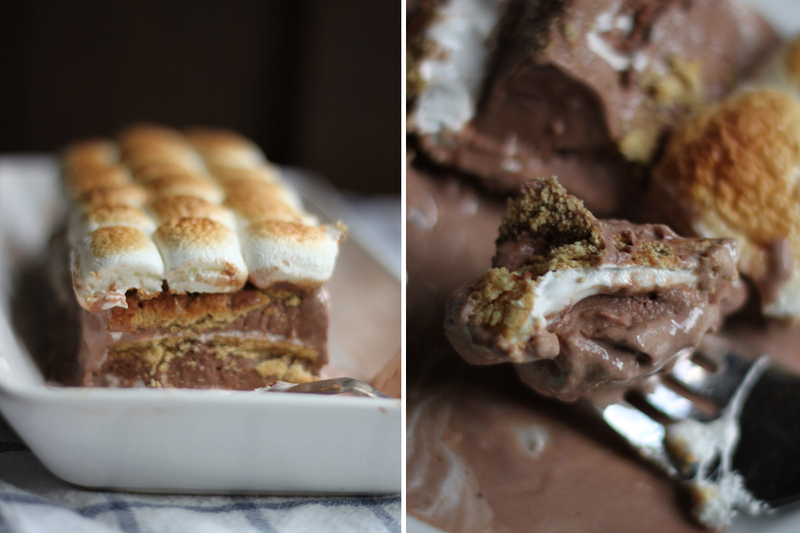 Usually I write it on my list of "unfinished business" and save it for a rainy day but this idea, this S'mores Ice Cream Cake got caught in my brain and it would not go away. I put it on the list and it still stuck in my head. I waited - hoping for the perfect occasion to make this cake - but nothing came. 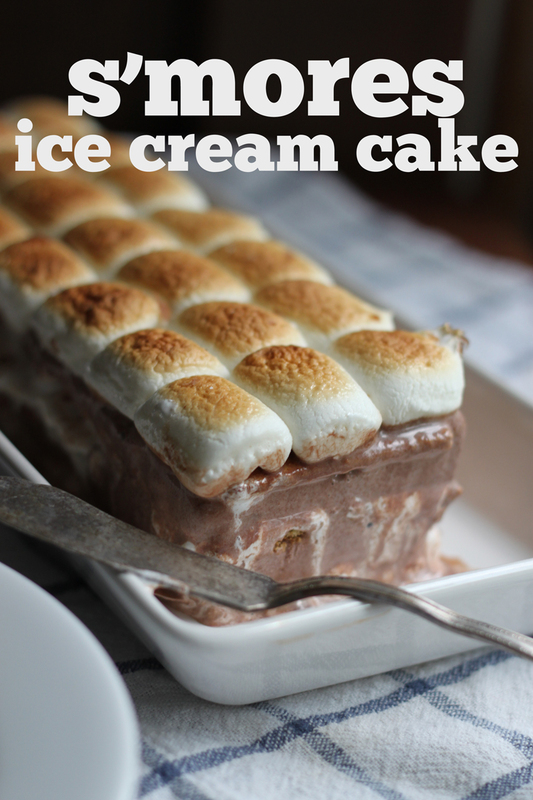 So here we are - I made you this cake for no other reason but my long-standing, ever-lasting love of s'mores, and ice cream, and an idea that got stuck in my head. I will probably eat the whole thing by myself as soon as these photos are published. You could go all Deb Perlman on this (seriously have you seen this cake?!) 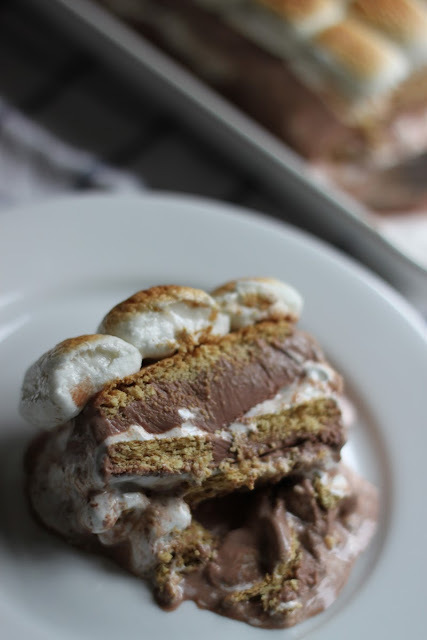 by making your own marshmallow, graham cracker, marshmallow fluff, and ice cream. But honestly, wouldn't that take some of the fun out of this ridiculous dessert? Line a loaf pan with parchment paper being sure to leave some over hang. Line the bottom of the pan with two graham crackers. 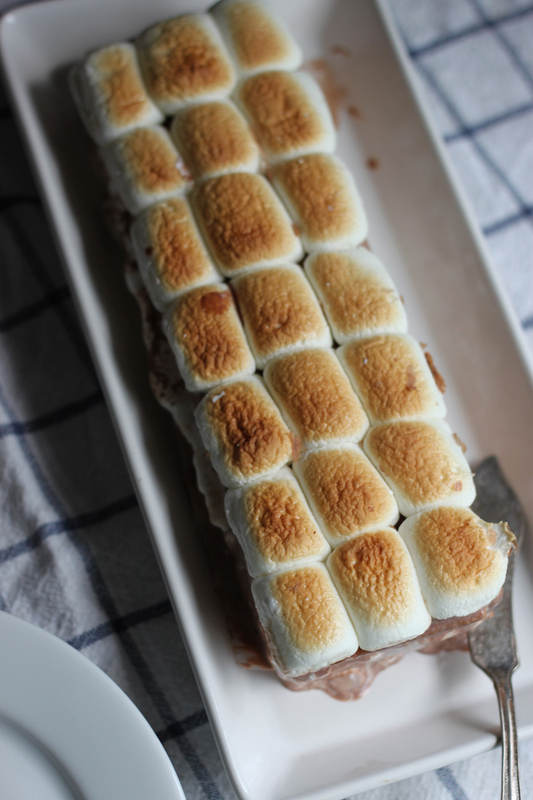 Top with half of the marshmallow fluff - spreading it into an even layer. Scoop in half of the chocolate and spread that into an even layer on top of the marshmallow fluff. Top with a layer of graham crackers and repeat - topping the dish off with a layer of graham crackers. Wrap the pan in plastic wrap and freeze for at least 2 hours. Heat a broiler to low. Remove the ice cream loaf from the freezer and unwrap. Arrange the marshmallow halves on top of the last graham cracker layer. Broil the whole loaf for 1-2 minutes or until the marshmallow is toasty. Use the parchment paper to lift the cake from the pan. Slice and serve immediately. Hi Meghan! I've been following delightedly since we met at the Maiedae Mixer. I'm making this THIS WEEK. Thanks for the delicious recipes and beautiful photos. Also, I appreciated your recent Cucumber Collins post-- I concocted a drink a while back involving fresh muddled basil, lemon juice, simple syrup, and orange gin topped off by ginger ale or club soda. It's a party favorite. Does that qualify as a collins? If not, any idea what the heck you'd call that?